The holidays are in full swing, as the eggnog flows, the fireplaces crackle, we start to gear up for 2019. This is the season of cheer, and while seniors are well within their rights to kick back and celebrate the winter observances, they should be sure to keep an eye on their health. Winter is always a tricky time with the weather and flu risks. Add in some seasonal concerns, like isolation, and seniors ought to be more cautious around the holidays to protect their well-being. The holidays are sometimes regarded as a two-month free pass for eating whatever you want. Thanksgiving feasts encourage second helpings (lest there be too many takeovers), while trays upon trays of Christmas cookies are sure to be baked. All this means that food is abundant around the holidays, and it's generally accepted to eat what you can before having to make a new year's resolution to trim a few pounds. However, eating a bunch of rich foods can wreak havoc on a senior's diet or digestion. That's not to say sweets and other seasonal treats have to be avoided entirely, but that moderation is always the key. Empty calories can lead to weight gain that might be harder to shake in retirement, as well as aggravate existing conditions like diabetes. This guideline also applies for alcohol. Don't worry about having one or two cocktails at a New Year’s Eve party, or a couple of glasses of wine while dining with family, but be sure to avoid excess. Overdrinking can result not only in a painful day after, but also impairment that can lead to falling, dehydration and potential kidney and liver damage. Not everyone can be home for the holidays, or have family come to them. It can be especially tough to deal with that in the wake of a recent loss, or maybe during the first holiday season away from family. 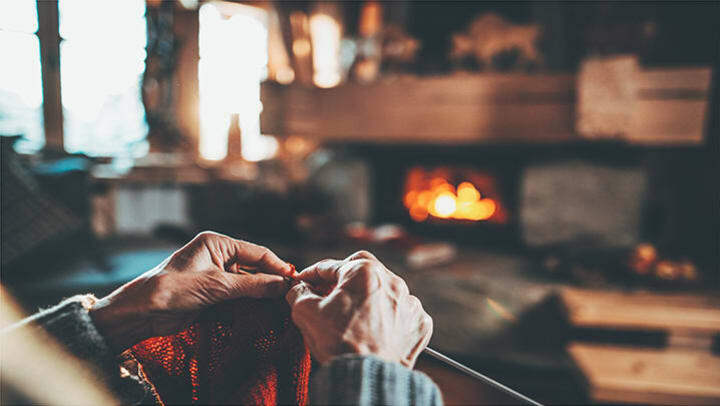 Seniors, both those who live in an independent retirement community or at home, should be mindful to check in on neighbors who might be feeling the winter woes. If you know of a fellow resident or a long-time neighbor on the block who could use some company, think about dropping by. It can do the mental health of both parties a world of good. Perhaps the hardest thing to do during the holidays isn't shopping for gifts, but getting exercise. Winter conditions in most of the country prevent outside activities like walking, while the overall atmosphere of the holidays hardly makes anyone more eager to get moving. However, seniors should do what they can to get vital exercise and maintain a healthy regimen for working off the cookies. While icy sidewalks make an outside stroll difficult, seniors can replicate the distance by walking the halls of a retirement community. If your facility has a staircase, try a few flights up and down. Indoor pools and recreation areas with equipment are usually available year-round, as well. Seniors should take some precautions, however, to ensure they don't overextend themselves. Joints are more likely to swell in the winter, and surgically repaired or replaced knees can tend to stiffen up. Wearing a brace or compression stockings while exercising can help, while cold and cold treatment afterward keeps the body in working winter shape. Seniors should take a number of precautions to ward off winter illnesses like the flu. Washing hands is at the top of the list. It's especially important for seniors who live in a community, where there's greater opportunity for shared spaces and daily interaction. Holidays with the family might mean days with the grandkids, and considering the mess kids can get into, hand-washing is a no-brainer. Seniors should also be vigilant to wash their hand when in their own apartment, not only before eating and after using the restroom. All told, the holidays are about easing back and enjoying the company of loved ones, family traditions and other seasonal joys. Yet with a whirl of social events or party invitations, it might seem hard to actually get time to relax. Seniors shouldn't feel obligated to attend everything and overstretch themselves. They should feel comfortable going to an event for only a set amount of time. Social stimulation is great, but limits are healthy. Making time for relaxation ensures that holiday stress is avoided, and there's more opportunity for family, baking, movies and even caroling.